Damascus: Syria’s President Bashar Al Assad was sworn in Wednesday for a new seven-year term in a red carpet ceremony in Damascus, after an election his opponents had slammed as a “farce”. Al Assad swore by the Quran before the country’s parliamentarians in an extraordinary session, 40 months into a conflict estimated to have killed more than 170,000 people. “Syrians, three years and four months... have passed since some cried ‘freedom’,” he said, referring to the start of a March 2011 revolt that demanded his ouster. “They wanted a revolution, but you have been the real revolutionaries. I congratulate you for your revolution and for your victory,” Al Assad told his supporters. “Those who lost their way can now see clearly... the monstrous faces have been unveiled, the mask of freedom and the revolution has fallen.” He said Western and Arab states that have supported “terrorism” will pay a “high price” and that he would fight insurgents until security was restored to the whole country. “Soon we will see that the Arab, regional and Western states that supported terrorism will pay a high price,” he told his supporters at the presidential palace. More than 1,000 people were invited to the inauguration ceremony, with Al Assad arriving at the presidential palace in a black sedan car before being met on a red carpet by a military band. Parliamentarians and other guests cheered for Al Assad in the hall where Al Assad was sworn in and then gave a speech. Al Assad won a June 3 election held only in regime-controlled territories by 88.7 per cent, defeating two other candidates seen as figureheads, rather than genuine opponents. The opposition National Coalition branded the election a “farce” even before it was staged, in a statement later echoed by US Secretary of State John Kerry and Nato chief Anders Fogh Rasmussen. During the first two years of the anti-Al Assad armed revolt, opposition backers in the West and the Arab world repeatedly insisted he must go. But the rise of Islamist militants has turned the tide and raised fears, especially in Europe, over the future. 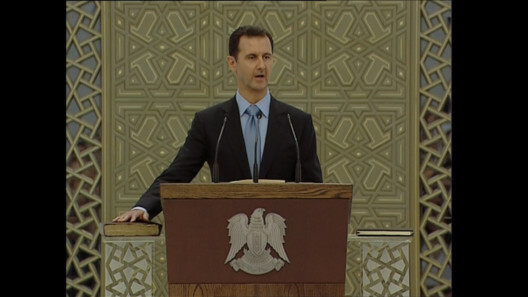 Analysts say the rise of Islamists has been a “gift” for Al Assad, who from the outset in March 2011 branded the revolt against his regime as a foreign-backed “terrorist plot”. The Syrian leader will try to take advantage of the West’s fear of Islamist extremism and present himself as a bulwark against the phenomenon, they said. Al Assad “is telling them: ‘I am your man in the region, I can face the terrorists and extremists, give me your support and your recognition’,” said Nashar. Following in the footsteps of his father and predecessor Hafez, who ruled Syria with an iron fist for 30 years, Al Assad has ignored the Western calls for his ouster. Al Assad’s regime has been propped up with the tireless financial, military and diplomatic backing of allies Iran and Russia. On the ground, Lebanon’s Iranian-backed Shiite militant movement Hezbollah has fought alongside the Syrian army, whereas rebels have remained divided and poorly armed. Weakening them further, rebels have fought Isil since January, in battles that have killed more than 6,000 people on the two sides.